I remember seeing pictures of the Shaun the Sheep sculptures when they were in London earlier in the year and had hoped that we might get the chance to see them. The trail finished before we got the chance to get to London so when Visit Bristol offered us the chance to go to Bristol to see the Shaun's along with some other attractions, I jumped at the chance. The Shaun the Sheep sculptures have been designed by artists, designers and celebrities and are all sponsored by different companies and organisations. They will be auctioned off to raise funds for The Grand Appeal and Wallace & Gromit's Children’s Charity, supporting children in hospitals across the UK. 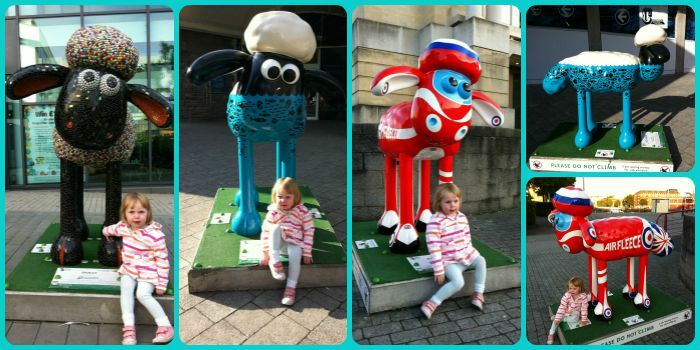 There are 70 statues all around Bristol on the Shaun in the City Trail. 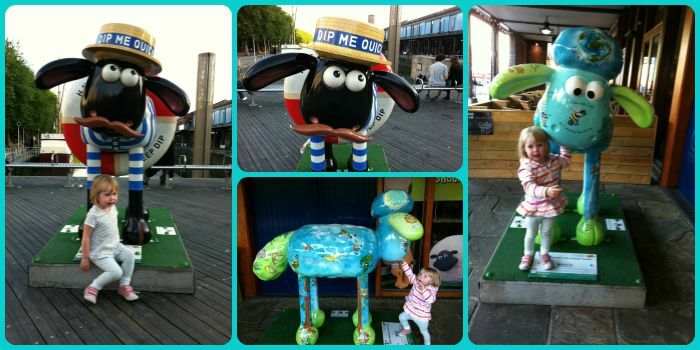 I think it's more achievable to see more Shaun's in Bristol as I heard that they were a lot more spread out in London. We couldn't believe how Little Miss A reacted to seeing the Shaun's. She was so excited and if she spotted one coming up she ran towards it. She actually posed for photos with almost all of them and she never poses for photographs! On our first afternoon in Bristol we came across 5 Shaun's. 1) Dolly - this one was a couple of minutes away from our hotel. It looked like he was covered in Smarties. It was a great texture to touch! 2) Life Aquatic - we found this one outside the Aquarium and it was covered in fishes and other sealife creatures. 3) Air Fleece - this Shaun was tucked away in a corner of Millennium Square. 4) Beach Boy - a really fun Shaun with a 'rubber ring' as Little Miss A kept describing it. This one was on Centre Promenade. 5) Green Poems for a Blue Planet - along the walkway of the Watershed was this Shaun which had lots of messages about being environmentally friendly. The following day we managed to see a few more Shaun's by getting off at stops on the Open Top Tour Bus. Firstly at the museums and then at the train station which is actually where our favourite ones were. 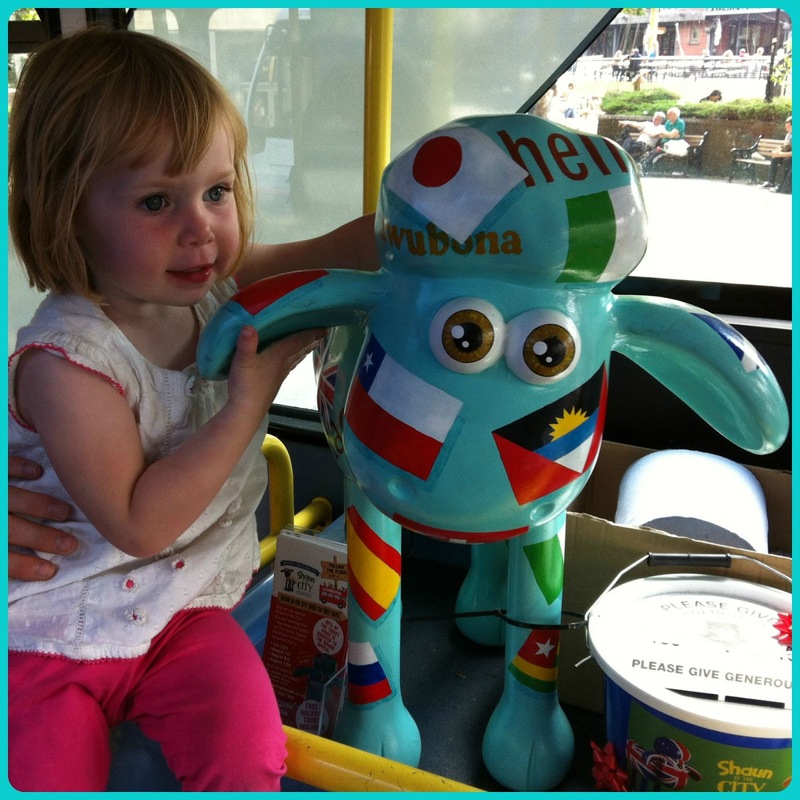 6) Rex - this Shaun is like a dragon so we did lots of 'roaring' whilst we were this one! 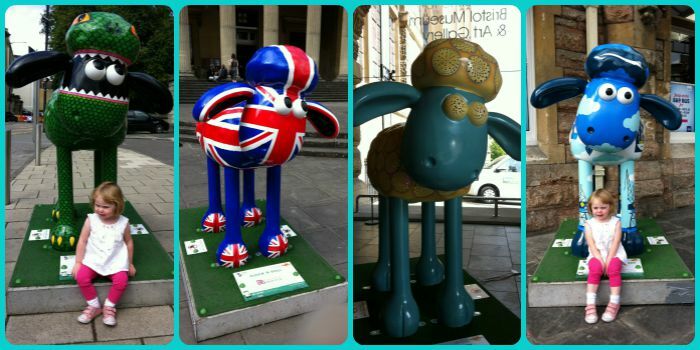 7) Flock 'n Roll - a really bright Shaun with the Union Jack on it. 8) Arabian Lights - the only Shaun that is actually indoors and is housed in the Bristol Museum. It actually lit up inside! 9) Alright Me Babber? - the first one we found outside the Train Station. 10) Great West Shaun - our favourite Shaun that we saw as it was like a locomotive steam train. 11) Bristol Express - another train themed one which had lots of lovely detail. We also saw a bonus Shaun on the last Tour Bus we went on - a mini one! We did spot a few other Shaun's from the top of the Tour Bus but obviously couldn't get good photos of these ones. We were so surprised by how much Little Miss A seemed to enjoy finding the Shaun's. She doesn't really know who 'Shaun' is, but after we'd seen each one, she kept asking for 'More Shaun'!! You can download a Shaun in the City Trail Map here. The maps are available at a few locations in the city but when we went both places we tried to get a map from had run out. The best way to do the Trail is using the App on your phone. Do this in advance though when you've got a good wifi connection. Find out more details here. 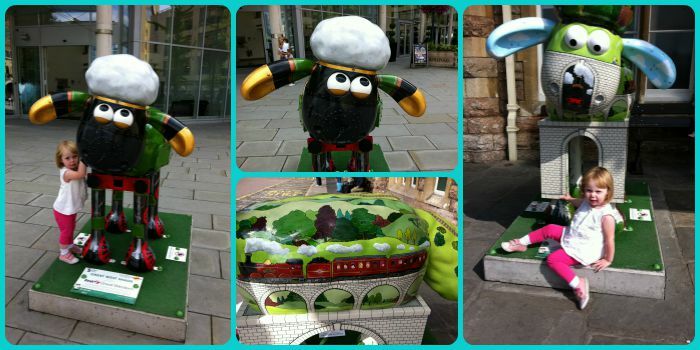 The Bristol Shaun in the City Trail is on until 31 August so there's only a couple of weeks left. If you can make it to Bristol, then do go. It's a fantastic thing to do with kids! I only wish we'd had more time to see some more! You can read more about our family trip to Bristol here. If I lived closer I'd have a look! I know Becky. We were lucky to get the chance to see them in Bristol having missed out when they were in London. Thanks Claire. They're not there for much longer so be quick! I love these, such a great idea for a fun activity and excellent that they will help charity too! I especially love the train ones too, of course that will be because I have a train mad monkey! Looks so much fun to do! Thanks Jenny. Hopefully we'll get to do another Trail of statues somewhere else soon as it is great fun! It is a shame they're not around for longer. Hopefully they'll do another trail next year!